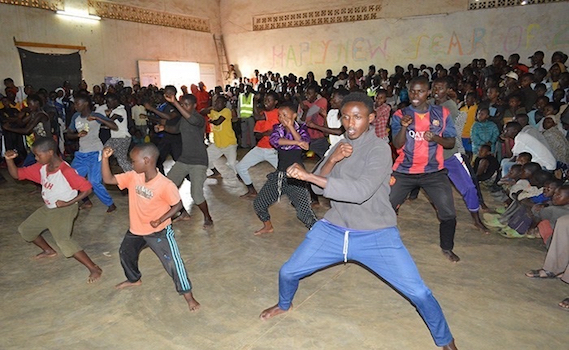 The Taekwondo Humanitarian Foundation (THF) and the Rwanda Taekwondo Federation (RTF) have launched a Taekwondo pilot project at the Kiziba Refugee Camp in Karongi district of Western Province, Rwanda. Official delegates from the THF and the RTF visited the Camp for the inauguration of the project, over the weekend and were received by the United Nations High Commissioner for Refugees (UNHCR) Rwanda. Received by United Nations High Commissioner for Refugees (UNHCR) Rwanda, the delegation first made a trip to a refugee family household. It was there that they met with a crowd of refugees from Burundi and Democratic Republic of Congo who have been attending the initial Taekwondo lessons. Camp leaders and refuges held a reception, which involved demonstrations of Taekwondo and Kung Fu. From this month, the Kiziba Taekwondo Academy will run for an initial pilot phase of one year. Two local Taekwondo instructors will offer daily training sessions twice a day, five days a week, while additional education activities are due to be introduced in the coming months. More than 400 participants are expected to take part in the training sessions. “In practice, the educational curriculum of THF’s Taekwondo academies aligns with the United Nations’ Sustainable Development Goals,” a THF statement reads. “With sport having a powerful impact on the realization of development and peace in its promotion of tolerance and respect, taekwondo has the potential to make great contributions to the empowerment of women and of young people, vulnerable individuals and communities while advancing health, education and social inclusion goals. Since the first visit of the THF and RHF in February, exploratory training sessions have taken place daily. UNHCR Rwanda claims the sessions have proven to create a high level of interest from the camp residents and have already had have a major impact. “With this first pilot project in Africa, and thanks to the serious commitment of RTF, THF hopes to strengthen and further develop its field operations for future initiatives benefiting refugees around the world,” the statement adds. World Taekwondo Federation (WTF) President Chungwon Choue officially announced his plan to establish the THF in his speech at UN headquarters in New York City on the 2015 United Nations International Day of Peace. Projects are also underway in Jordan as well as in Turkey and Nepal.